Well, that’s more like it. After two straight weeks of horrible defense, the New England Patriots bounced back with a dominant performance against the Miami Dolphins. New England’s defense held Miami to just 175 yards and seven points on the day, with most of that production coming long after the game’s outcome was decided. While several players were responsible for this dominant showing, none were more important than the edge duo of Trey Flowers and John Simon. 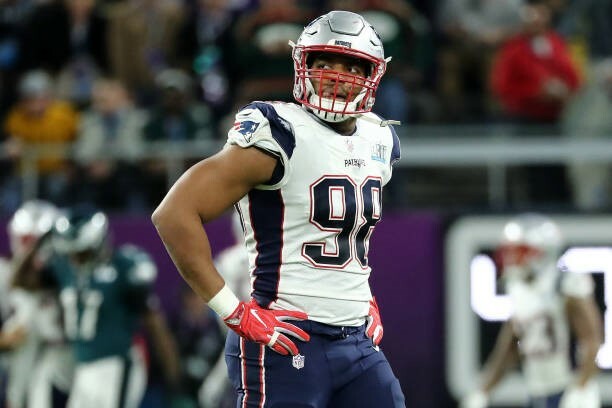 There’s no overstating just how much the Patriots defense missed Trey Flowers. Flowers suffered a concussion early in Week Two against the Jacksonville Jaguars, and the defensive play dipped dramatically. The Patriots defense sans Flowers allowed a combined 57 points during Weeks Two and Three. During Weeks One and Four, the Patriots defense allowed a combined 27 points, with most of those points coming in garbage time. Obviously, Flowers’ presence can’t be credited for all of that, but this data is indicative of just how important he is to the defense. According to Pro Football Focus, Flowers has a 90.9 grade on the season. While he hasn’t played enough to qualify for PFF’s leaderboards, his 90.9 grade would place him among the league’s elite edge defenders. He’s a monster against both the run and the pass and is capable of singlehandedly blowing up plays every single time he steps on the field. His impact is evident when looking at sack totals and run totals with and without him on the field. The Patriots recorded five sacks during the two games he played compared to just one in two games without him. Flowers is directly responsible for 1.5 of those sacks, and has brought the pressure which cause a few other sacks. Additionally, Flowers’ work in the run game is unparalleled among his teammates. Flowers typically lines up across from the left tackle and the Patriots defense just couldn’t replace him. In two games without Flowers, the Patriots defense allowed an average of 7.3 yards per carry on runs off left tackle. In Week Four, Miami didn’t attempt a single run off left tackle, and only averaged 0.5 yards running behind left tackle. While Simon didn’t have the same impact as Flowers, the newest Patriot looks to be an incredible fit for this defense. It’s only a one-game sample, but Simon’s early returns are promising. For one, Simon saw 20 snaps against Miami, second among the Patriots defensive ends. In those 20 snaps, Simon graded out well against the run and recorded a sack. The fact that he’s able to see that much action and make plays despite joining the team just under a week ago speaks to just how good he can be for New England. The Patriots needed a player capable of setting the edge opposite Flowers throughout the entire 2017 season. Deatrich Wise is a fantastic young player, but his work against the run is a little too inconsistent. He has improved in Year Two, but right now he’s best used as the third edge defender. Simon has a history of being successful against the run and the pass. While his ceiling isn’t as high, he’s a player made in a similar mold to that of Rob Ninkovich. Fortunately, New England won’t need Simon to be as good as Ninkovich was. They’ll just need him to do his job opposite Flowers. Having both Flowers and Simon on the field made all the difference for the Patriots. So long as Flowers is the on the field, the Patriots don’t have to worry about having an active liability on the edge. Adrian Clayborn is a good enough pass rusher, but he lacks gap integrity and constantly gave up the edge against the Jacksonville Jaguars and the Detroit Lions. Likewise, Keionta Davis didn’t have the size to hold up against the run. With Flowers on the field, opposing offenses don’t have a weak side to attack. Additionally, Simon manning one edge allows the Patriots to shift one of Flowers or Wise inside on passing downs without worrying about the quarterback escaping the pocket. As of now, Flowers and Simon are the only linemen capable of consistently playing both the run and the pass off the edge. Deatrich Wise can grow into the role, but he’s not quite ready for that yet. He is getting there though and has notably improved against the run this season. The Patriots defense can be even more impressive if Flowers, Wise, and Simon can all rotate off the edge. For now, Wise should serve as the third member of the edge rotation, with Simon and Flowers serving as the top two options. For the first time since 2016, Trey Flowers has a competent starter opposite him. Flowers and Simon have the potential to keep any play between tackles, and Deatrich Wise is good enough to rotate in without a notable drop off. Edge defense has been the Patriots biggest problem for some time now. If Flowers and Simon can stay healthy, this defense has the potential to be a top-10 unit in the league.